Two weeks ago a Texas man started an initiative in his neighborhood to show support for police officers. 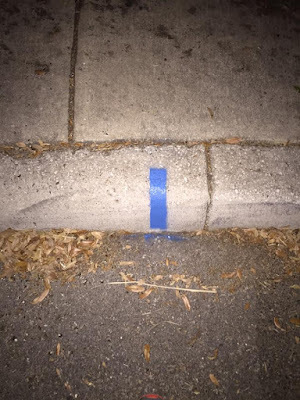 Anthony Welichko called it “The Safe Harbor Initiative” and as a sign of solidarity with police, he spray painted a little blue strip on the curb in front of his San Antonio home. According to Welichko, the blue strip was meant to let officers know that the person occupying the home has their back and appreciates their service. Dealing with Fort Thomas Police on a weekly and almost daily basis for Fort Thomas Matters, I know how important they are to our community. And how professional they are. And how they go above and beyond to make sure that the residents are safe. They are people, just like you or me, except their job is to keep us safe and they do it knowing that everyday they could be putting themselves in danger to do so. Because of that, I wanted to show them how appreciated they were here. So, I followed Welichko's lead. I put up an article on the Safe Harbor Initiative on Fort Thomas Matters with an invitation that I would personally spray paint a thin blue line on the curb. Forty-four houses later and I was out of spray paint. From Chesapeake to S. Fort Thomas Avenue, requests poured in. I needed someone to pick up the baton. He not only volunteered to have his house striped, but he offered to help. "I feel that it's important to let officers know that even though the mainstream media portrays them in a negative light, they are people who support them," he said. Between FTM and Mcelwee, 49 homes in Fort Thomas have showed their support for local police. Mcelwee, who moved to Fort Thomas in May chose to move here because the schools were outstanding. "My fiancé lived here for about eight years and the kids missed their friends. It's a safe place to live because of police." Whether it's a blue stripe on the curb or a strip of blue reflective tape on your mailbox, can we keep this going? So if don't this are you saying I don't support the police? No it doesn't. All it is is a visual support. Chief Mike Daly and his force are outstanding! We are so lucky to have the group we do. How about a piece of blue tape on your car left rear bumper.